This project concerns the function of the projection from the deep nuclei of the cerebellum to the inferior olive. It was shown with direct stimulation of the nucleo-olivary fibres (Hesslow 1986) and by indirect methods in collaboration with Gert Andersson and Martin Garwicz (Andersson & Hesslow, 1987; Andersson, Garwicz & Hesslow, 1988) that this pathway is inhibitory and GABA-ergic. Nelson, Barmack and Mugnaini showed that the neurones contain GABA. We suggested that the cerebellar inhibition of the olive is a negative feed-back mechanism, controlling both synapse-specific cerebellar plasticity and general excitability of Purkinje and deep nuclear cells. The first assumption was tested and confirmed by Hesslow & Ivarsson (1996) and Fredrik Bengtsson (2004) and the second assumption was confirmed by Fredrik Bengtsson (2006). He has shown that blocking the nucleo-olivary pathway causes an increase in climbing fibre acitivity that is sufficient to silence spontaneous activity in Purkinje cells. Anders Rasmussen, Riccardo Zucca and Pär Svensson are currently working on more subtle aspects of this control system. The third body of work, mainly done together with Magnus Ivarsson and Pär Svensson, has addressed the role of the cerebellum in classical conditioning. Hesslow (1994a,b) and (Ivarsson, Svensson & Hesslow, 1997) showed the role of several microzones in the cerebellar cortex in bilateral control of conditioned eye-blink responses. Hesslow & Ivarsson (1996) supported the hypothesis that conditioned responses via nucleo-olivary inhibition provides a negative feed-back signal to the inferior olive. Recordings from Purkinje cells (Hesslow & Ivarsson,1994) support the cerebellar model of classical conditioning (Yeo and Hesslow, 1998). The most recent work has concerned the role of the mossy fibre system as a pathway for the conditioned stimulus information to the cerebellum (Svensson, Ivarsson and Hesslow, 1997; Hesslow, Svensson and Ivarsson, 1999). We are currently pursuing a project for studying human eyeblink conditioning. We are using a setup developed in Chris de Zeeuw’s lab in Rotterdam by Bas Koekkokk, Henk-Jan Boele and Jan-Willem Potters for training humans with tone and airpuffs. Blinks are monitored by measuring changes in the magnetic field generated by a small magnet fastened on the eyelid. The PhD student Karolina Löwgren is using the setup for studying children with speech and language disabilities. The working hypothesis is that the underlying problem for some of these children is a cerebellar dysfunction. This is a theoretical project concerning possible brain mechanisms for generating the inner world of consciousness and thinking. Hesslow (1994c, 2002) (and some papers listed under Philosophy) suggest that the inner world arises as a consequence of the brain's ability to generate its own input. A ’simulation’ theory of cognitive function is developed. It is based on three core hypotheses about brain function. First, it is assumed that behaviour can be simulated by activating motor structures as during an overt action, but suppressing its execution. The second assumption is that perception can be simulated by internal activation of sensory cortex as during normal perception of external stimuli. Third, it is assumed that both overt and covert actions can elicit perceptual simulation of their normal consequences. A large body of evidence supports these assumptions. It is argued that the simulation mechanism can explain many of the traditional problems concerning consciousness and the inner world. The basic idea has now been implemented in robot simulations by Dan-Anders Jirenhed, Magnus Johnsson and Tom Ziemke. The group descends from the research group headed by Olov Oscarsson who was a PhD student of Anders Lundberg and later worked under J.C. Eccles in Australia. Oscarsson studied the spinal pathways to the cerebellum and his main contributions were the discoveries of the zonal and microzonal organisation of the cerebellar cortex. G. Hesslow, who was a PhD student of Oscarsson, started working on the physiology of the cerebellar climbing fibre system under the guidance of Gert Andersson and Carl-Fredrik Ekerot. Hesslow's main interest was behaviour and he studied classical conditioning in Christopher Yeo's lab at University College, London. He then set up a new laboratory in Oscarsson's old department and now works on the cerebellar mechanisms of classical conditioning with his students Fredrik Bengtsson, Dan-Anders Jirenhed and Magnus Larsson. The research is mainly funded by The Swedish Medical Research Council, Åhlenstiftelsen, Gyllenstierna-Krapperupstifelsen. Campbel NC, Hesslow G (1986a), The secondary spikes of climbing fibre responses recorded from Purkinje cell somata in the cat cerebellum. Journal of Physiology 377: 207-224. Campbel NC, Hesslow G (1986b), The secondary spikes of climbing fibre responses recorded from Purkinje cell axons in the cat cerebellum. Journal of Physiology 377: 225-235. Hesslow G (1986), Inhibition of inferior olivary transmission by mesencephalic stimulation in the cat, Neurosci Lett 63:76-80. Andersson G, Hesslow G (1987), Inferior olive excitability after high frequency climbing fibre activation in the cat, Experimental Brain Research 67:523-532. Andersson G, Garwicz M, Hesslow G (1988), Evidence for GABA-mediated cerebellar inhibition of the inferior olive in the cat, Experimental Brain Research 72:450-456. Hesslow G. (1994a) Correspondence between climbing fibre input and motor output in eyeblink related areas in cat cerebellar cortex. J Physiol 476:229-244. Hesslow G (1994b). Inhibition of conditioned eye-blink responses by stimulation of the cerebellar cortex in the cat. J Physiol 476:245-256 . Hesslow G. (1995). Classical conditioning of eyeblink in decerebrate cats and ferrets. In Ferrell and Proske (ed.) Neural Control of Movement. Plenum Press. pp 117-122. Hesslow G, Ivarsson M (1994). Suppression of cerebellar Purkinje cells during conditioned responses in ferrets. Neuroreport 5:649-652. Hesslow G, Ivarsson M (1996). Inhibition of the inferior olive during conditioned responses in the decerebrate ferret. Exp Brain Res, 10:36-46. Svensson P, Ivarsson M and Hesslow G (1997). Effect of Varying the Intensity and Train Frequency of Forelimb and Cerebellar Mossy Fiber Conditioned Stimuli on the Latency of Conditioned Eye-Blink Responses in Decerebrate Ferrets. Learning & Memory, 4: 105-115. 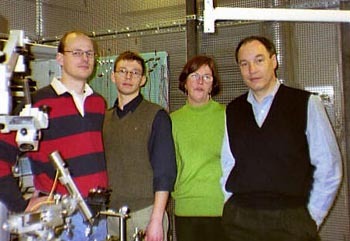 Ivarsson M, Svensson P and Hesslow G (1997). Bilateral disruption of conditioned responses after unilateral blockade of cerebellar output in the decerebrate ferret. J Physiol , 502: 189-201. Yeo CH and Hesslow G (1998). Cerebellum and conditioned reflexes. Trends in Cognitive Sciences , 2: 322-330. Hesslow G, Svensson P and Ivarsson M (1999). Learned Movements Elicited by Direct Stimulation of Cerebellar Mossy Fiber Afferents. Neuron, 24: 179-185. Hesslow, G. (2001) New lecture on consciousness. Powerpoint presentation. Bengtsson F & Hesslow G (2006). Cerebellar Control of the Inferior Olive. Cerebellum 5: 7-14. Svensson P, Jirenhed DA, Bengtsson F, Hesslow G (2010) Effect of Conditioned Stimulus Parameters on Timing of Conditioned Purkinje Cell Responses. Journal of Neurophysiology 103:1329-1336. Johnsson, M., Gil, D., Hesslow, G. and Balkenius C. (2011). Internal Simulation in a Bimodal System. Scandinavian Conference on Artificial Intelligence (SCAI 2011), Norwegian University of Science and Technology, Trondheim, Norway. Bengtsson,F. and Hesslow,G. (2012). Feedback control in the olivo-cerebellar loop. In Manto M, Gruol D, Schmahmann J, Koibuchi N and Rossi F. (eds), The Handbook of the Cerebellum and Cerebellar Disorders. Springer. Hesslow,G. (2012) Current status of the simulation theory of cognition. Brain Research 1428:71-79.